The 77th annual Dogwood Festival on Greenfield Hill, Fairfield, will take place Mother's Day weekend, May 11-13. The Greenfield Hill Congregational Church's annual Dogwood Festival returns to celebrate with the region -- and several area charities -- the hope symbolized by spring. The festival's 77th edition will take place, regardless of weather, on the church grounds on Mother's Day weekend, beginning today (Friday, May 11) through Sunday. Chairwoman and church member Karen Wambach of Westport said visitors to the annual "country fair" can help support the various charities that benefit, while enjoying everything from arts and crafts shows to walking/running races for children and adults. Wambach said net proceeds will support national and international nonprofits and such local charities as Operation Hope (of Fairfield), Janus House (of Bridgeport), Center for Women and Families of Eastern Fairfield County and Project Learn (of Bridgeport). Michael Howard, a longtime church member and Dogwood Festival Properties coordinator, added, "The Dogwood Festival has, for 77 years, been a wonderful tradition within the Fairfield community, involving so many in our congregation to make it the success that it is every year." Wambach, who is chair for the second straight year, said the warmer-than-usual winter temperatures caused many of Greenfield Hill's dazzling pink or white dogwood trees to bloom some time ago and that they may be past their prime during the festival. 77th DOGWOOD FESTIVAL Dogwood trees in Fairfield's Greenfield Hill neighborhood may not be in full bloom for the 77th annual Dogwood Festival beginning May 11, but there will be plenty to do besides admiring the festival's namesake trees. Hours of the festival, which takes place on the grounds of Greenfield Hill Congregational Church, 1045 Old Academy Road, are 10 a.m. to 5 p.m. May 11 and 12, and noon to 5 p.m. May 13. The schedule of events includes: TODAY 10 a.m.: Opening of the Dogwood Festival Art Show 11:30 a.m.-1:30 p.m.: Third annual Dogwood Festival Friday Luncheon. Includes floral arrangements, "how to" demonstrations for creating dramatic planters and pots, and a pruning discussion led by a local arborist 2 p.m.: Piano duets with Sandra Murphy and Rita Lapcevic SATURDAY 8:30 a.m.: Fifth annual Dogwood Dash, a 2-mile family fun run and walk 10:30-11 a.m.: Dogwood Mini Dash for youngsters 2 to 7 1 p.m.: Performance by Greenfield Hill Congregational Church's Choir and Men's Chorus 3 p.m.: Performance by Fairfield Country Day School's Pinstripes Chorus and Bell Choir 4:30-6 p.m.: Meet the Artist reception at art show 7-10 p.m.: "Paint the Town" barbeque and dance to raise funds for a painting project at Greenfield Hill Congregational Church SUNDAY Noon: Blessing of the Animals 2 p.m.: Piano selections by Alex Beyer 3:30 p.m.: Musical performance by Pivot Ministries Men's Choir The festival also will offer children's crafts and games, a baseball pitching booth, guided walking tours of the historic area, a juried crafts show, a tag sale, and a plant and garden boutique. Check the church's website, www.greenfieldhillchurch.com, for any revisions. "Whether we have blossoms or not, the area is always so beautiful and there are so many things to do," she said. "It's a great Mother's Day event, great for families, great for young people, for couples." Visitors return year after year because "everyone has a favorite part of the festival," she added. This year there will be a plant/garden boutique; an art show featuring the work of local artists; a juried craft show, featuring more than 40 New England crafters; entertainment in the church sanctuary; children's crafts and games; radar speed baseball pitching; walking tours of area gardens and historic sites; and tag sale "treasures" at Kate's Clothes and Kate's Corner & Antiques. Several on-site cafes will be selling food and refreshments. Salads, sandwiches, soups and desserts will be served in the Church House's Memorial Room. At outdoor tents, sweet treats, and grilled hot dogs and hamburgers also will be available. 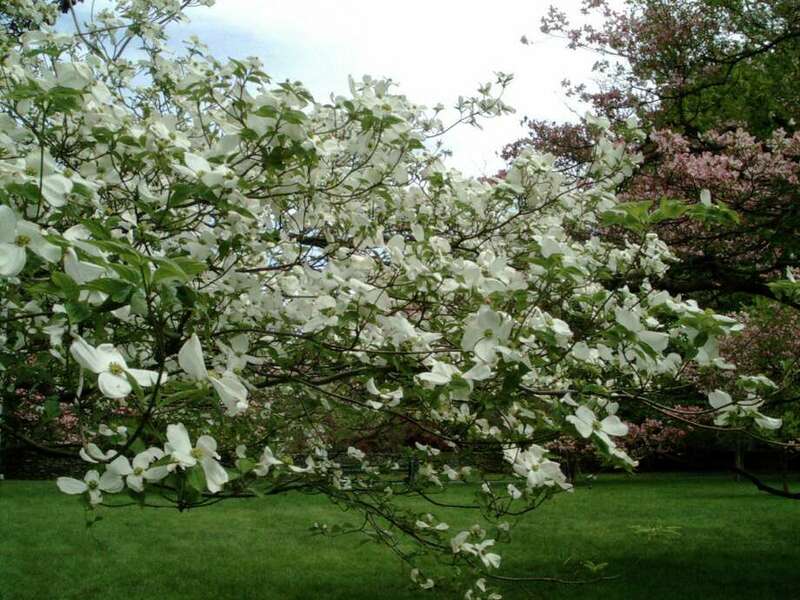 Dogwood trees in Fairfield's Greenfield Hill neighborhood may not be in full bloom for the 77th annual Dogwood Festival beginning May 11, but there will be plenty to do besides admiring the festival's namesake trees. Hours of the festival, which takes place on the grounds of Greenfield Hill Congregational Church, 1045 Old Academy Road, are 10 a.m. to 5 p.m. May 11 and 12, and noon to 5 p.m. May 13. The festival also will offer children's crafts and games, a baseball pitching booth, guided walking tours of the historic area, a juried crafts show, a tag sale, and a plant and garden boutique. Check the church's website, www.greenfieldhillchurch.com, for any revisions.